SmartSide engineered wood up close. Note life like texture. Comes pre-primed from factory for better paint cohesion. Looks just like real wood without the high maintenance of wood. Comes in many styles and textures. Engineered wood.. by LP Building Products. LP Building Products is a leading manufacturer of high quality building materials. Builders and homeowners use our products primarily in new construction, repair and remodeling, and manufactured housing. LP products are sold through distributors, dealers, professional lumberyards, and retail home centers. Headquartered in Nashville, Tennessee, LP has been named one of the safest companies in American and operates production facilities in the U.S., Canada and South America. Engineered wood products have the look and texture of read wood only stronger and more durable than real wood. Less expensive than real wood siding, engineered wood looks exactly like wood, made from wood strands and/or wood fibers, strong resins and zinc borate added to protect from termites and fungal decay. How Strong Is Engineered Wood Siding? 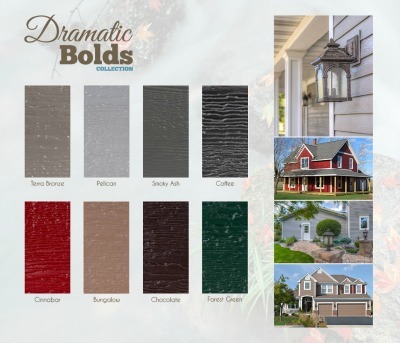 Comes in many of the popular types, such as board and batten, and lap siding. Here is Lp SmartSide Lap Siding. Comes in smooth texture or rich cedar grain. Board and batten siding is used here on the gables of this house. Looks exactly like real cedar wood siding without the high maintenance of real wood. Stronger than real wood, mold and termite resistant. Costs less than real wood siding but more than vinyl siding. It requires professional installation. Withstands harsh weather better than both wood and vinyl. 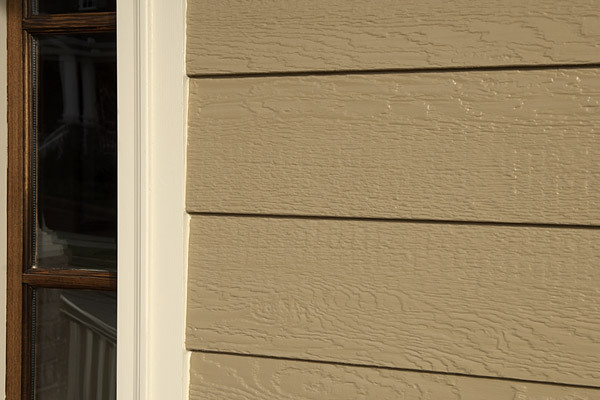 Engineered Wood Siding comes in several different textures, from smooth cedar to deeply grained Cedar texture. Looks like freshly painted cedar planks. Requires much less maintenance, painting, and resists harsh weather better than real wood. To see pictures of homes using this product click here. Pictures. 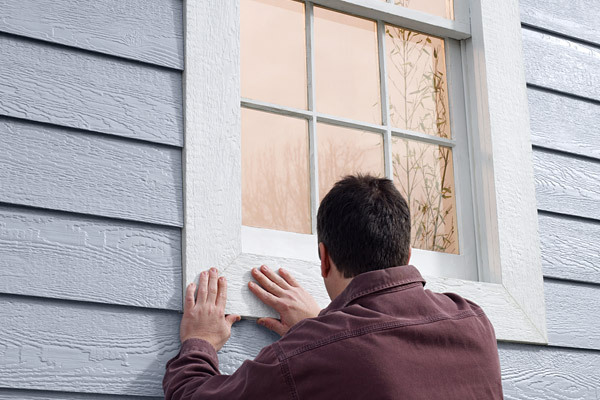 Back to Cement Board Siding click here. 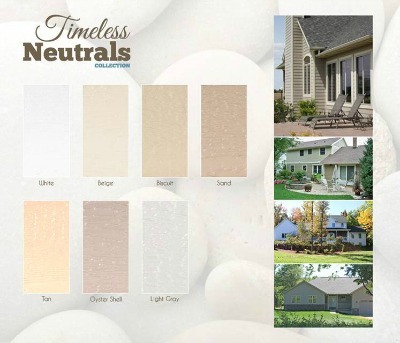 Go back to Vinyl Siding Styles...click here. 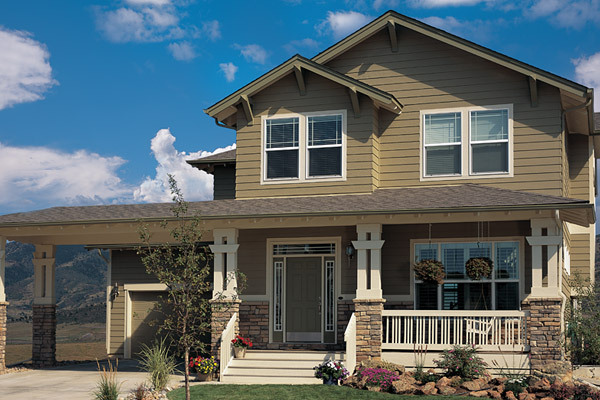 To go back to Vinyl Siding Manufacturers, click here. Factory finish colors are added to create an almost unlimited color pallet. To see more color choices click here. 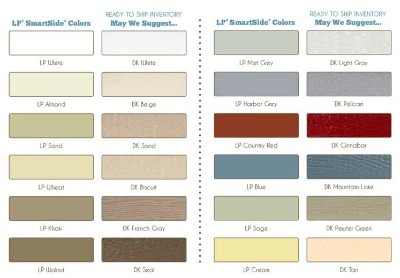 LP SmartSide Engineered Wood Siding custom colors. 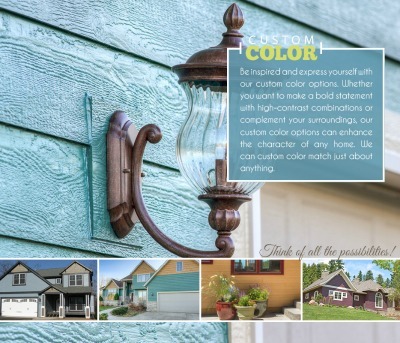 Now you can get factory applied custom colors for your siding. To see more information click here. Applied here window trim. Mold and termite resistant it make a excellent trim material for areas of the house where you don't want to have to paint every few years. Most older homes have weather related problems with wooden window and door frames. 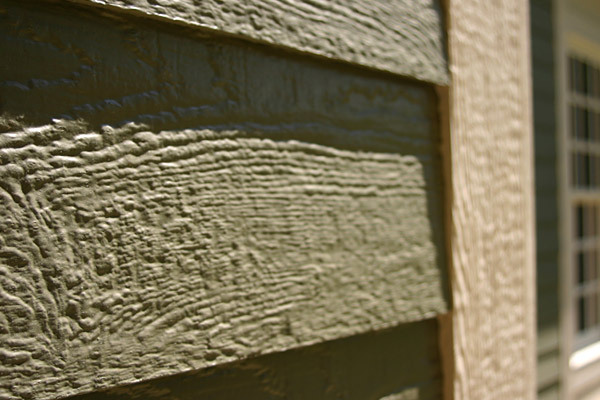 Engineered wood is more resistant to rot, mold and termite damage than wood siding. It applies just like real wood, easy to cut and nail, just stronger and more durable. Can be painted any color. So matching or color coordinating the trim around your house is as easy as picking out the right color of paint that you like. This product is great for use in areas where regular wood is hard to get to and keep painted. Areas where water damage and rot is common. 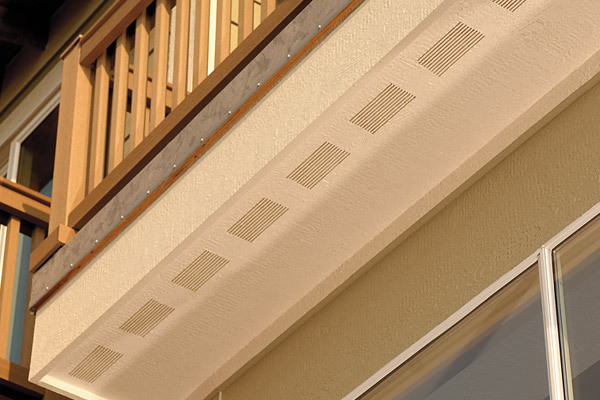 Engineered wood used as soffit with pre-cut vents. Good protection in areas where rot and mildew are always a problem. Making this house low maintenance and stylish too. If you have problems like this, this is the perfect place to use this product. 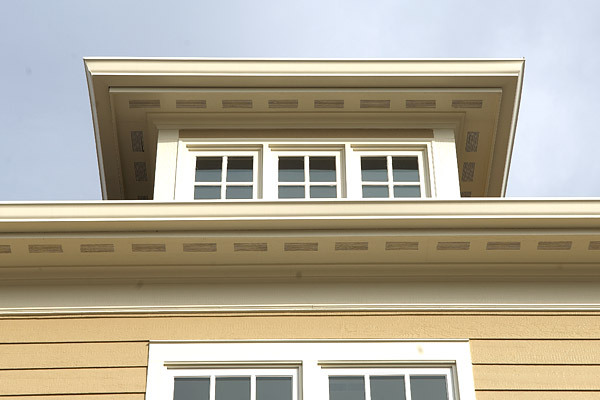 You only want to have to replace the soffit and facia one time, make sure you use something that is water and rot resistant. If you are looking for a wood alternative engineered wood is certainly worth looking into. It cost a little more than vinyl siding but is much stronger, will stand up to harsh weather better and has much less maintenance than real wood. To see LP Building Products web site click here...LP Building Products. Some people refer to Cement Board Siding or Fiber Cement Board as well as cement fiber siding all as the same type of product. They are very similar in that they are all man-made products that look like real wood. Hardie Board is one of the best selling products in the country. 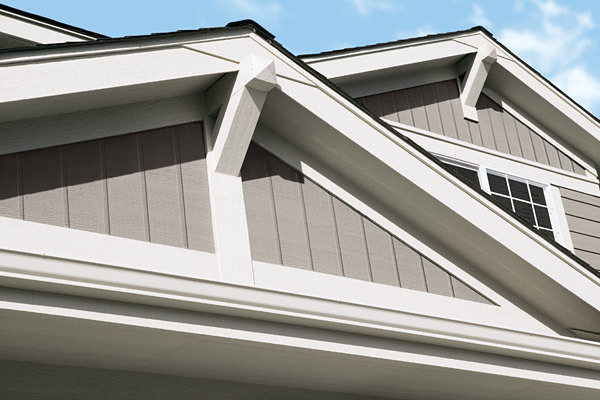 To see more information on Cement Board Siding types and styles click here: Cement Board Siding.